In the 30 years we've been helping adoptive families, we're often asked what the adoption experience is like. New families want to hear from others who have been through the process, to learn about the ups and downs of their successful adoption. We started this page with that thought in mind. If you're new to adoption and are interested in working with Dr. Kors, take a look at the thoughts of some of our recent adoptive families as they speak about Dr. Kors as well as the struggles and joys in their adoption journey. 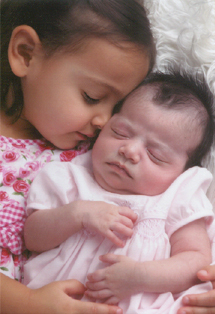 In December 2009 one of our wonderful adoptive moms, Jo Trizila, welcomed her daughter Katherine Suzanne into the world. Recently Parenting magazine published a profile of the single mom, providing an intimate portrait of her adoption experience. The article by reporter Deborah Skolnik begins with Jo's initial interest in adoption and moves forward to the joys of parenthood. 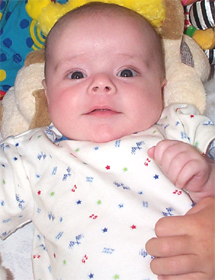 In October 2007 Bree and her husband Lance adopted a beautiful baby boy, Eli Benjamin. Since then Bree and Lance have stayed in touch with Eli's birthparents, Angela and Roy. This October Bree, Eli, Angela and Roy reconnected to spend some time at the local park. Nancy was there and took some wonderful photos of the occasion. Afterwards Bree wrote us a lovely letter, reflecting on the afternoon. I wanted to write and tell you thanks for taking all the pictures and for finding time to spend with us. Our meeting with Ang and Roy was really incredible. Eli really did bond with them, and they got to spend quite a bit of quality time with him. They are both such incredible people with big hearts. I can only imagine that it was both heartbreaking and heartwarming to spend that time with Eli. I don't know if I would be strong enough to endure what they did today, but I am grateful they did. My son is very lucky, and his life will be so blessed for having them both be a part of it along the way. Thank you, not just for facilitating a wonderful adoption and getting me my beautiful son, but for continuing to help us facilitate this great relationship with his birthparents. I will be forever in your debt and in thiers for this gift of love. 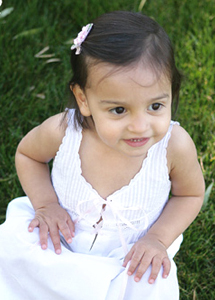 Dave and Paula's beautiful daughter Amelia Marie was born on December 15, 2008. 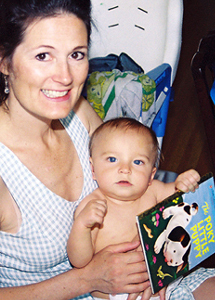 Paula reflects on their adoption experience. Words cannot express just how we grateful we are to Nancy and Sondra. Thanks to them, we are now the parents of a wonderful baby girl, Amelia Marie. It was Nancy who connected us with the perfect birthparents, the most loving people anyone could get to know. We hope that Amelia is as beautiful on the inside and outside as her birthmom. The road to our adoption wasn't easy. Our first match didn't work out. But through those ups and downs, Nancy was with us every step of the way. At every turn, she was caring, honest and trustworthy. Looking back, I see how her commitment to us was an important part of the adoption's success. We were nervous and needed a lot of hand-holding, reassurance that in the end everything would be okay. After meeting Amelia's birthparents, we had a good feeling about things. It's amazing how quickly we became friends with them. Becoming friends was really important to us because now, we we will always have that bond. Amelia will grow up knowing she has two sets of parents who love her so much. I'll never forget the day we got the call to come back to California because our birthmom was in labor. We were so excited! Sondra waited by the birthmom's side until I arrived 30 hours later. Having Sondra there really made the difference. During that time, I got to know her and our birthmom on a deeper level. It was a great experience, one I will be able to share with Amelia when she gets older. We have a plaque in our home that says, "Everything happens for a reason. Just believe." Our adoption journey has shown us just how true that is. Angela, Paula and Dave's birthmother, shared her adoption experiences with us as well. To read her story, click here. 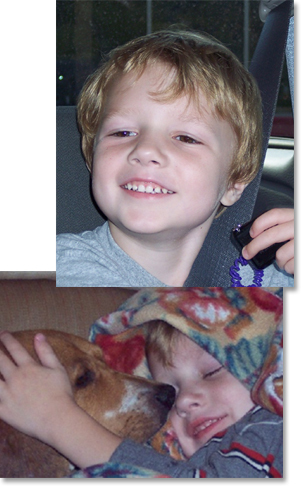 In 2002, Sandy and her husband Dan adopted Austin. Soon after they expanded their family again, adopting an energetic young beagle named Charlie. Recently Sandy wrote to tell us that Austin is doing wonderful and that he and Charlie have developed a deep bond. When Cascade Beagle Rescue asked us to foster Charlie, one of the abused and neglected beagles found in a garbage dumpster, we did not hesitate to say yes. Little Charlie came to us as a very ill and frightened boy. He obviously had never lived in a home before. As soon as Charlie stepped onto our kitchen linoleum, he did a face plant right on the floor. When the dishwasher started up, he ran and hid. Poor little boy. He was also a bit wild and crazy when it came to food and what he considered to be his possessions. This little wayward beagle had to eat his food on a cookie sheet so he wouldn’t eat too fast and was banned to the laundry room with the door shut at mealtime. David and his partner Barry have now adopted two children, Zev and Summer. Nancy Hurwitz Kors is a miracle worker. She has helped hundreds of couples adopt. I think what sets her apart from other adoption specialists is that she really believes that lesbian and gay people can be terrific parents, and she is able to convey that to birthmothers. Without her help, I am not sure we would be parents today. Her commitment to the lesbian and gay community is exemplary. My partner and I have two children, adopted at birth and now 5 and 9. Our lives are so full and rich that I can't imagine not being a parent. I strongly encourage anyone considering adoption to do it and work with Nancy to make it happen now. 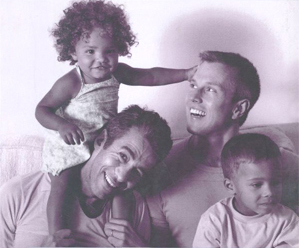 David Strah talks about his family's adoption experience in his new book "Gay Dads: A Celebration of Fatherhood." For more info, click here. Since writing of our first adoption experience (posted below), we have been blessed with another beautiful child through Nancy’s practice. We are thrilled to announce that we are the proud parents of Elizabeth Charlotte. Our family is now complete; we have two beautiful and healthy daughters. Our birthmoms were treated with love and respect, making the entire situation wonderful for all of us. 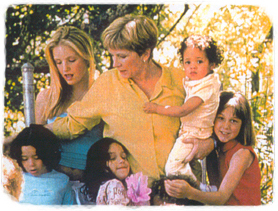 We look at our girls and know we wouldn’t have them if it hadn’t been for Nancy and Sondra. Mel and Barb are the proud parents of Emma Patricia-Lorraine, who recently celebrated her second birthday. The couple speaks about adopting Emma, seen here relaxing in her delightful white dress. We are thrilled to be parents, and it wouldn't have happened without Nancy and Sondra. When we started down the path of creating a family through adoption, we looked at a multitude of options and spoke to all our friends who had adopted. They told us about working with an adoption agency, and we were disappointed to hear about long wait times. Only one couple we spoke to had positive things to say about the process. As we spoke with them, it became clear that it was their facilitator who made the difference. They used Adoption Facilitation Services -- Nancy Hurwitz Kors. On their recommendation, we met with Nancy, and it's amazing how fast we made a connection. She truly became our facilitator before the meeting was over. Nancy took the time to listen to our desires and didn't make any judgments about our preferences. Talking about adopting can be an awkward conversation, but she put us at ease. The speed of the process was amazing too. From that first meeting until the day we held our daughter Emma in our arms was just 13 months. 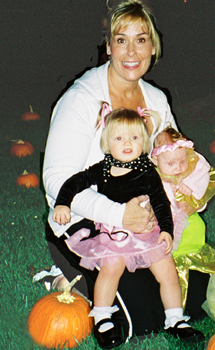 We were blessed with a wonderful birthmom; we can't imagine a lovelier girl. And our beautiful, healthy daughter -- she is the light of our lives. We know we wouldn't have her today if it weren't for Nancy and Sondra. People ask us sometimes about the journey of adoption. And it's true: Adoption is an emotional process. Through it, though, Nancy and Sondra really cared about us and cared about our birthmom. We were all treated well, and we all ended up happy and in the exact situation we wanted. Our birthmom still calls occassionally to say how thankful she is that we were matched. We feel the exact same way. So much so that we are now in the process of adopting our second child through Nancy. We have friends who are amazed that we are going through the emotional journey again and using a facilitator. But we know now from experience that Nancy and Sondra will put their hearts into finding us the right situation and that, with their guidance, we will have another baby. We wouldn't think of adopting again without them. 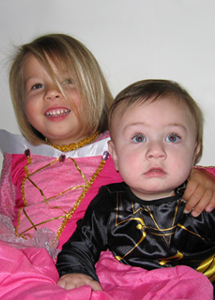 Stan and Phillip are the proud parents of full siblings -- Summer and Lake, seen here dressed up as Cinderella and Zorro. Stan and I were encouraged to see Nancy after over three years of waiting and many troubled matches with another facilitator. We were feeling like we were not getting opportunities to meet birthmothers because we are gay. Nancy insisted that wouldn't be an issue with her. A few short months later, along came Summer in December 2001. 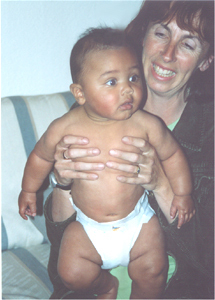 On New Year's Day 2004, William Lake was born. He and Summer are full siblings. Nancy and Sondra were amazingly supportive despite some significant challenges in getting Lake placed with us so the siblings could be together. Summer and Lake are both incredible and adore each other unbelievably. We are blessed to have these two perfect children. Every day they teach us about life. Brad and Sarah are now the proud parents of three children -- Paul, Carly and Robert, seen here with "The Poky Little Puppy." Sarah and I have adopted three children. Our first adoption was through an agency. We have had the pleasure of working with Nancy Hurwitz Kors, Ph.D., on our last two adoptions, approximately one year apart. From the first time we met Nancy, we could tell that she was genuinely committed to assisting birth parents and adoptive parents to successfully match and complete an adoption. It was clear that she believes in the importance of adoption. The reason that we returned to Nancy to help with a second adoption was because of her obvious experience and professional approach in dealing with the complex psychological issues affecting both birth parents and adoptive parents. She was always available to both us and the birthmothers we worked with. We found that she was honest and direct with us regarding any potential risks associated with a prospective adoption. At all times, we felt fully informed. It appreared to us that Nancy put great thought into matching adoptive parents with birth parents, clearly considering the needs and desires of both parties. It was clear that she took great satisfaction in our happiness, and it was her great pleasure to assist both birth parents and adoptive parents toward a healthy and positive life change. Sarah and I have recommended Nancy to many people who are interested in adoption. She is professional, responsive and dilligent in her work. We would recommend Nancy above any agency. Sandy is now the mother of two girls, Alessandra Clarice Erica and Ava Maureen, who was born on June 23, 2005. If you had told me when I first signed up with Nancy that I would be the mother of two beautiful girls within three months, I wouldn't have believed it. As a single woman, I was skeptical that I'd be matched at all. But Nancy reassured me, and after speaking with other single moms who had worked with her, I became optimistic. As it turned out, not only was I chosen - I was chosen quickly. I felt so blessed to be matched with my birthmother. Both she and I believe it was meant to be. I feel that Ava and Alessandra were meant to be with me, and I'm grateful to Nancy for helping make that happen. Nancy and Sondra truly do special work in bringing people together, in helping make families. 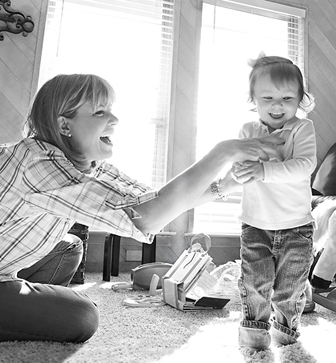 Each of our lives is better because of our adoption experience. I'm grateful to Nancy and Sondra for making my dreams come true. was born on January 11, 2005. We had had our dream come true thanks to Nancy and Sondra. William is such an incredible addition to our family. He's the happiest, healthiest little boy. We were not the easiest family for Nancy to work with either, but she and Sondra put up with us through all our ups and downs, through the whole journey, and enabled us to welcome William into our home. Having been through the adoption process now, we have a lot more admiration for the work Nancy and Sondra do then we did at the start. I remember standing with Nancy at her annual Christmas party, when she looked around the room at all the children and spoke proudly about the good future they can look forward to, thanks to adotion. She is right to be proud. Her office gives us adoptive parents the chance to bring those children into our homes, into our families. was born on July 3, 2003. Our adoption was not an easy one, but the amount of care and support Nancy and Sondra showed to us, especially in the final days of the adoption, was just remarkable. 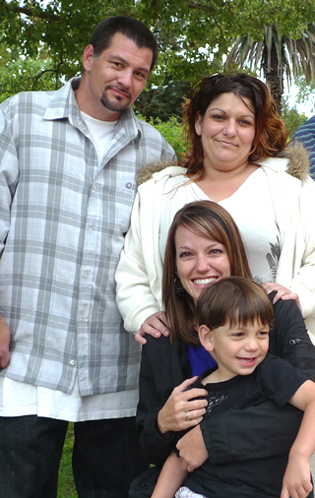 It was their dedication to our family that made adopting Matthew possible. At first, the situation wasn't so easy. There was a newborn who had been placed with another couple, but that couple changed their minds when the baby was born because he had meconium aspiration and needed medical support on his first day of birth. The family was afraid the baby might have birth defects as a result. Nancy called us because she knew I was a former intensive care baby nurse and could access the situation. When we met the baby, both my husband and I fell in love at first sight. He was such a beautiful baby boy, even with the tubes and wires everywhere. Another bump in the road to adoption was the behavior of the birthmother and birthfather. Both had struggled with drug problems and, at times, didn't act rationally. Nancy and Sondra were wonderful, connecting us with the social workers at UCSF and dealing with the birthparents' sometimes crazy demands. If Nancy had not been readily available during this important time, I don't think we would be the parents of Matthew. But she was. She was continuously available. We could always contact her or Sondra by phone, and I had Nancy's cell phone number for emergencies as well. Matthew spent 13 days in the hospital before coming home. Today he is a very happy, very healthy two-year-old boy. We are thankful to Nancy and her staff for helping to make our dream a reality. Stephanie just adopted her eighth baby through us. She is now the mother of eight girls and one baby boy -- Nathaniel David, born March 8, 2005. I was interested in adopting, and a single woman I knew recommended Nancy. As a single mother myself, I thought I was at a disadvantage. But Nancy reassured me. She said almost everybody gets matched - and they get matched pretty quickly. Boy, was she right. I've now completed eight adoptions with Nancy and am the mother of eight beautiful little girls and one rambunctious baby boy.